Zero-Depth Entry Tot Pool (up to 4 years of age) - Water entry is level and gradual to allow access for all persons. Water features include a Shower Tower, Aqua Hoop, and Otter Slide. A water access chair is available in the pool house lobby. Zero-Depth Entry Intermediate Pool (4 to 7 years of age) – Water entry is level and gradual to allow access for all persons. Water features include a Drop Jet, Rain Drop, and Storm Spinner. A water access chair is available in the pool house lobby. 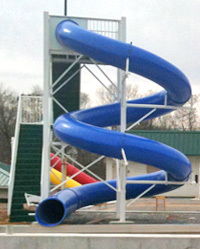 Flume Slides – Each slide is 7 feet high and futures a dual action red drop slide and a yellow tube slide. Supervisors on duty control the use of this slide. Blue Drop Slide – This 17.5 foot high tube slide winds and drops to the waiting water below. All slides are restricted to those who are a minimum of 48 inches tall, or who have passed the deep water swim test. Climbing Walls – Two climbing walls (intermediate 2 meters high and advanced 3 meters high) have a textured non-slip design; tilted slightly over the water. General safety rules will be strictly overseen. The 6 lane, 25 meter Competition Pool features water depths from 4 to 5 feet and is fully equipped with Kiefer anti-turbulent lane lanes, KDI Paragon starting blocks, and a fully automatic Colorado timing system. Children ages 12 and under must pass the deep water test to use the pool and its features without an adult. Parents/adults may take their non-swimming children into the 4-foot area of the Competition Pool, with the understanding of the water depth upon entrance. Reminder: only properly fitting, U.S. Coast Guard approved floatation devices are allowed. Anyone using a floatation device must be accompanied at arm’s length by a responsible adult. Lap Swimming and Adults Only swimming will be scheduled. All pools are ADA accessible. Lifts for persons with disabilities are stationed at the edge of each pool. Use shall be under the direction of deck management. A water access chair for persons with disabilities is located in the pool house lobby.